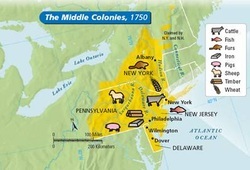 The middle colonies are made up of 4 states, New Jersey, Pennsylvania, New York, and Delaware. The middle colonies attracted a large population of ethnic and religious diversity. This diversity started at the early years of the colonies. The middle colonies were originally settled by the Dutch, however the English saw the Dutch as a threat so they drove the Dutch out. They later on renamed the colony the Dutch had settled in New York. From then on New York was a New English settlement. Pennsylvania became a colony where quakers where welcome, so most of Pennsylvania was filled with quakers and anyone who wanted religious freedom. The quakers welcomed anyone into Pennsylvania so there was much diversity. A large amount of the middle colonies where also from Germany and many spoke German instead of English as well. The Dutch were the first to settle in these colonies, like said in the paragraph above. Many of these Dutch where looking for land ownership and gold. However, when the English saw how powerful the Dutch where becoming they saw them as a threat and sent in ships to wipe them out. The moment the ships appeared on the horizan the Dutch surrendered and the colonies where immediately taken over by the English. The English's main goals where the same as the Dutch, to look for land and gold. They also had another goal though, which was to keep the Dutch and other countries from becoming too powerful. This goal quickly went away and was accomplished once the Dutch surrendered. With the great soil and perfect climate, this land provided much wealth to the settlers later on. The only other people who came to the colonies, who weren't looking for some type of wealth or power, wanted religious freedom. The middle colonies had much of this so most of the settlers here volunteered to come for this. The geography in the middle colonies had quite a few rivers. The most known ones being the Hudson and the Delaware rivers which ran right through the middle of them. These rivers make the soil very rich and great for planting. The winters here are not harsh like in New England, they are perfect weather for farming. Pennsylvania has a very long growing season and much very fertile soil. These combined made Pennsylvania one of the richest American Colonies of all. The weather did get cold, but not for very long and when it did it wasn't as harsh. This mad the middle colonies very desirable to settle in. The middle colonies were full of diversity in religion and culture from the very beginning. Pennsylvania was known to welcomed quakers and let the world see all of their ideas. The quakers welcomed all people of any religion. Because of this pennsylvania had a religious tolerance. By the early 18th century the middle colonies, along with the rest of the colonies as well, had developed societies that valued religious liberty, freedom of conscious, and representative government. As said in the geography section, the Hudson and Delaware rivers run through these colonies. Because of these rivers shipping and commmerce were very popular. Not quite as popular as in New England, but still very successful. Because of these rivers the colonies also had very rich soil. With only mild winters these colonies where perfect for farming and it was a very popular job here. They also had a West India Company, which was mainly a fur trading settlement. They had New Amsterdam built to protect these settlements, and nay other fur trading settlements around. Many of the social systems here included slaves. Even thought he slaves lives where harsh, they still had land ownership which they say makes it worth it.